What Do A Former Prime Minister, TV personalities, Politicians & A Whole Bunch Farmers Have In Common? Manifeasto Photography was engaged by Landcare Australia Ltd to photograph the 2 day conference held at Crown in Melbourne and the Awards Dinner at The Royal Exhibition Building. Nearly 1000 delegates attended the conference to hear scientists, farmers, chefs, politicians and fellow landcarers share their knowledge, enthusiasm & passion. People came together from across the country and it was nothing short of inspiring. Pip Courtney from ABC’s Landline was Master of Ceremonies and did a cracker of a job over the two days. With Pip’s knowledge and journalist experience there was no-one better suited for the job! Matt Moran spoke of his childhood growing up on a farm and the importance of valuing locally-grown produce and knowing where our food comes from. Scientists such as Dr Mark Howden, Tanya Ha, Dr Stefan Hajkowicz were among the presenters inspiring and informing the delegates. The awards dinner held in the spectacular Royal Exhibition Building with Catriona Rowntree the Master of Ceremonies for the evening. Catriona’s passion for Landcare and enthusiasm ensured everyone was engaged & entertained! 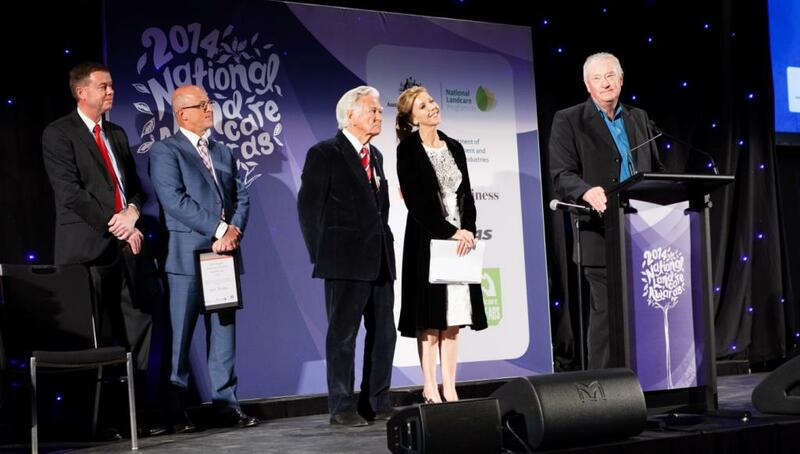 Some of the award presenters included Gardening Australia’s Costa Georgiadis, Minister Ryan Smith, Senator Bridget McKenzie, and the former Prime Minister of Australia and ‘father’ of Landcare, Bob Hawke. Bob Hawke spoke about Landcare and presented the ‘Bob Hawke Landcare Award’ to NSW farmer Colin Seis. It was an amazing conference and I’d like to thank all those who were happy to have a camera shoved in their face during the two days! Special thanks to Landcare Australia Ltd staff who did a stellar job of pulling the whole thing together! It was a monster effort and very much appreciated by the delegates from across the country! PS I’ll be adding some photos from the conference to my gallery over the next few days.